The Baltimore area is know for great food, whether it's the fresh seafood, tasty desserts, or the delicious soup and sandwiches. If you are planning to visit Baltimore, Maryland, or if you live there already, it's good to know where to find the best Black-owned restaurants. Not only will you be supporting minority business owners, but you will find that the food is so good, you'll want to come back again and again. 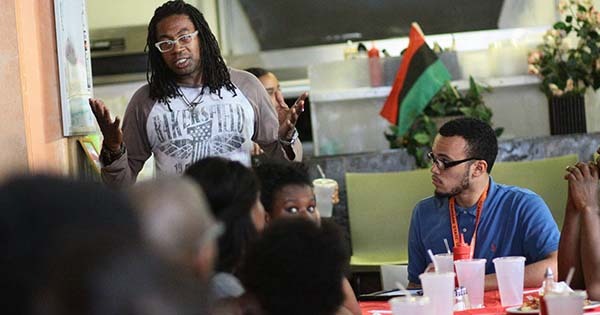 #1 - Terra Cafe: This community-centered and family oriented restaurant, founded by entrepreneur Terence J. Dickerson (pictured above), offers a wide range of delicious food, and a menu complemented with daily specials and seasonal items. The restaurant is also a commonly-used gathering spot for local artists, college students, and more. #2 - Southern Blues: Soul food at its best can be found in the heart of Baltimore at Southern Blues. This popular restaurant, opened in 2000, serves favorites like barbecue chicken and ribs, cornbread, collard beans, sweet potato pie, banana pudding, and lots more. #3 - Land of Kush: This Black-owned restaurant offers the ultimate vegan experience. Celebrate a new way of life with healthier food. They work with vegetarians, vegans, and health conscious people who struggle with finding quality, tasty vegetarian food and want access to a location to experience their food and services. #4 - Fresh Fresh Seafood: If seafood is your bag, guess what this restaurant serves? You'll find all kinds of seafood, including gumbo, shrimp, crab, catfish, and delicious sides like mac and cheese, collard greens, and sweet potato fries. #5 - Dessert Fantasies: If you have a real sweet tooth, you must try the cupcakes at Dessert Fantasies. Owner Tosha draws customers in with her row house with the bright pink accent wall. Once inside, you're hooked with cupcakes like strawberry shortcake, banana pudding, blueberry lemon, cookies and cream, smores, red velvet, and oh, ice cream, too! #6 - Flight Restaurant & Bar: For a nice relaxing dinner, try Flight's varied menu, which includes vegan dishes. They will accommodate special dietary requests, too. Whether you go for happy hour and appetizers, soup and sandwiches, or a dinner entre, you are sure to find a wide selection of home cooked favorites. #7 - St. Mary's Restaurant & Bar: For a peppy atmosphere along with authentic Jamaican cuisine, try St. Mary's located in the beautiful Charles Village neighborhood. From roti to wings, oxtail to Codfish Callaloo with bananas, fried dumplings, and fried plantains, you will love the Jamaican cuisine as well as the reggae music on Saturday nights. #8 - Shareef's Grill (House of Wraps): This restaurant is known for their healthy grilled shrimp wraps. They use all fresh ingredients, which is probably why you see their food truck all over town.